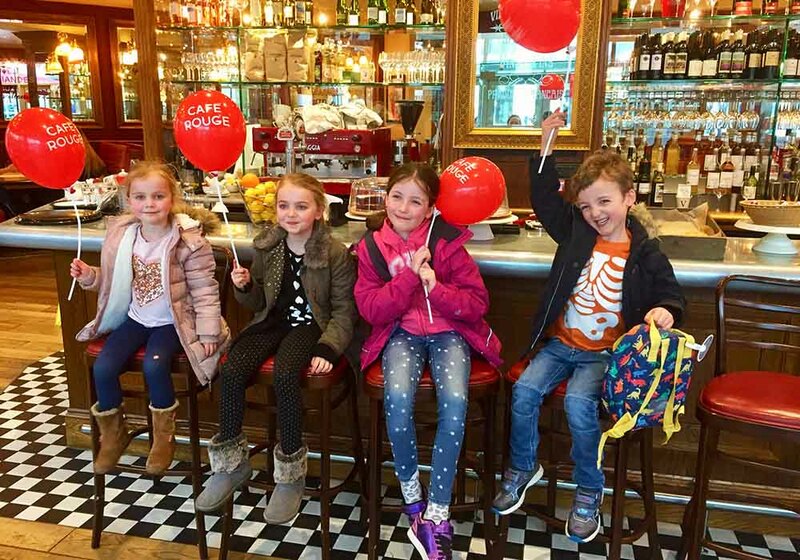 Last week LittleBird Mums, Alex and Louisa, treated their kids (ages 4 to 7) to lunch at Café Rouge, sampling the new Spring Menu and making the most of the exclusive Kids Eat Free voucher. They had a magical time and were delightfully impressed with their whole experience. The staff were warm and friendly, the kids had plenty to keep them occupied (including balloons, activity sheets…you name it), the service was prompt and most importantly, every single dish was demolished enthusiastically as Alex and Louisa watched in awe. ‘After a busy morning, a cooling Spring mocktail was welcomed by us Mums, whilst the kids got stuck into their word-searches and anagram-solving. 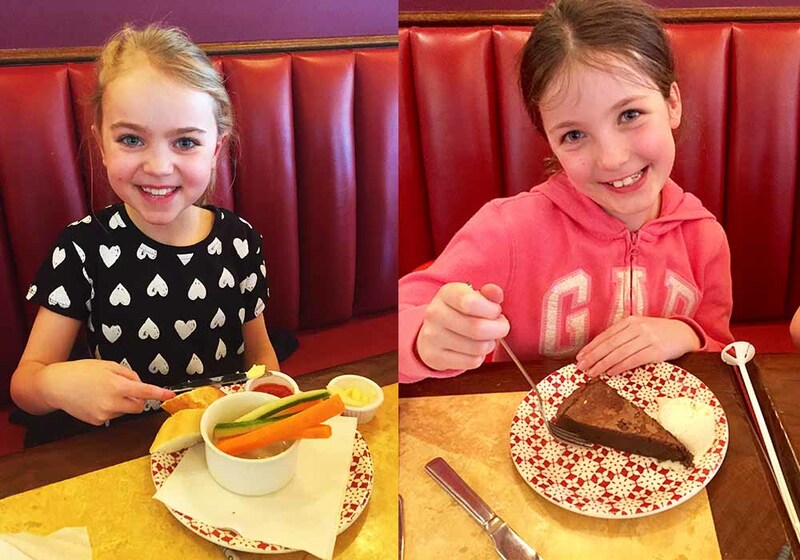 ‘Le menu des enfants’ made a refreshing change from the usual unimaginative and bland children’s options, with a real focus on quality ingredients and fun but nutritionally balanced meals. Classic meals with a French twist, the kids chose a baguette with crudités and salsa to start and had the choice between Poulet ooh La La!, Poulet Goujons, Le Burger, Bangers et Mash or Fab Fishcakes for main course. As for the Mums, we went for 2-courses at a very reasonable £11.50, although deciding what to have from this wasn’t easy by any means. The new Spring menu includes a number of mouth-watering dishes such as Pork rillettes, Panier de Champignons, Boeuf Partmentier, Moules, Tarte de Saison and Steak Frites…doesn’t everything sound even more drool-worthy in French?! The dishes arrived to a chorus of “oohs” and “ahhs” from both the kids and us…! Generous portions ensured there was enough to satisfy the very largest of little appetites and we were extremely grateful for the patience and accommodation of the waiters, who happily switched mashed potato for chips, fetched condiments, mopping up dropped food and popping gravy on the side for our fusspots! For dessert, the kids got stuck into chocolate brownie and fruit ice lollies, which notably were a welcoming change as a healthier option on the pudding menu, with no artificial flavours, colours or added sugar. Affordable day out = check! Happy tummies = check! Pat on the back for Mums, Dads, Aunties, Uncles, Cousins, Grandparents, Neighbours, Parents-from-school = check! Whilst it can be a daunting prospect during the school holidays, Southbank has got plenty to offer for families. The London Eye, Tate Modern, HMS Belfast, Southbank Centre, Shakespeare’s Globe, Shrek’s Adventure are among a few. If looking at a number of these larger attractions, one idea worth considering for the holidays is the Merlin’s Magical London Ticket which although an initial expense, is well-worth it. For £40 for a Child and £55 for an Adult, it gets you access to Shrek’s Adventure, Madame Tussaud’s, SEALIFE Aquarium, The London Dungeon AND The London Eye. You have to visit Shrek’s Adventure first but from that date onward you then have 90 days in which to visit the other attractions, although there is nothing stopping you from doing all 4 in one day! 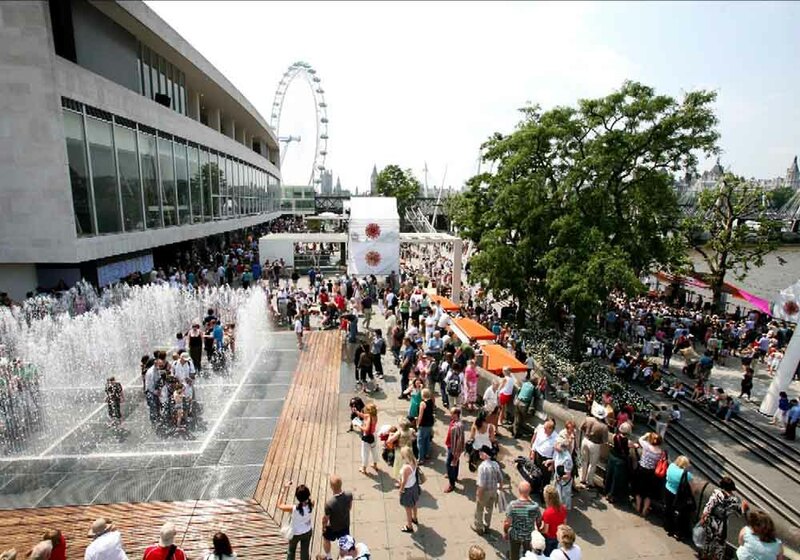 The Southbank Centre often runs free children’s workshops. Over the Easter Holidays they are running a number of musical and poetry workshops for different ages. See the full events list on their website here. The cathedral is no doubt an impressive structure and offers wonderful views but St Paul’s Cathedral are also great at putting on special events for families over the School Holidays, although these do sell out quickly as they’re very popular. Even if you don’t manage to get a ticket for one of their family events the cathedral is still an exciting place to visit. Be sure to pick up the family multimedia tour when you get there, which is divided into sections for each area of the Cathedral and features an introductory film, activities and things to find in each area. A friendly phoenix is the guide, explaining what to look out and offering fun facts along the way. Head on over to Café Rouge St Paul’s to enjoy a little slice of Paris in the heart of London and you’ll be well on your way to a great day out. The ideal location for a pre-theatre meal or a break from shopping. Whether you’re planning an evening of magic with Matilda, carpet rides with Aladdin, life lessons with the School of Rock or exploring The Serengeti with The Lion King, Cafe Rouge Covent Garden are sure to fuel you up for all your fantastical adventures (and prevent any grumpy little explorers during the interval). There’s also the London Transport Museum which is chock full of interactive galleries. Hop aboard real buses and trains, or have go on the Underground driving simulator. With the beautiful Neal’s Yard, the sci-fi megastore Forbidden Planet and the Moomin Shop at Seven Dials just a stone’s throw away, Covent Garden is somewhere you’ll never be short of fun things to do. 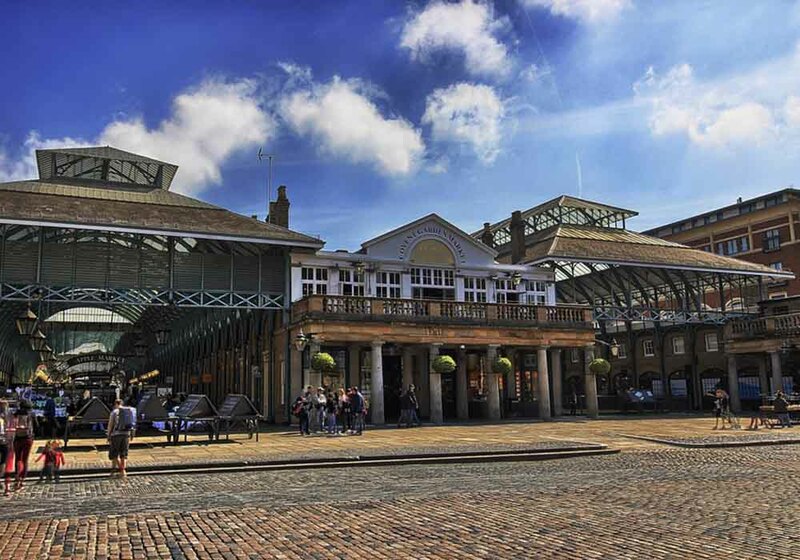 The list of things to do in Greenwich is endless but some of our top picks would be the Royal Observatory (for any budding astronomists), Greenwich Market, Greenwich Park, the National Maritime Museum (a great family-friendly museum with plenty of interactive activities for kids), the Cutty Sark or the wonderful Mudchute City Farm just a hop across the river on the Isle of Dogs. Take a slightly different approach and head off on the Greenwich Cable Car Treasure Trail courtesy of treasuretrails.co.uk, which will take you on a spy adventure around Greenwich and the Royal Docks. You can get 26% off your own personalised treasure trail currently on LittleBird here. A little further afield on the Greenwich Peninsula is Dinosaurs in the Wild, which is a new interactive and immersive experience that will take you on a trip back 67 million years ago to a research station where you will learn all about dinosaurs and see these mighty creatures in all their glory. Enjoy 20% off on LittleBird here. You’ll have surely earned a trip to the Café Rouge in Greenwich or at The O2 on the peninsula by the time you’ve checked all of these off! Wherever you end up exploring, remember to download your FREE Cafe Rouge voucher here. Have fun!